Literary discovery is not limited to the restricted and tall walls of academia whose discourses, though enlightening, may flood the mind of an average reader with their high-brow ‘isms’, leaving him/her desolate on the barren field of incomprehension. Howard, however, successfully evades raising the level of academic waters to the critical boundary, offering a coherent, as well as well-balanced reading. He commences his analysis on the works of Fritz Leiber, a multi-award-winning writer of fantasy, science fiction and horror. Leiber’s fascination with the supernatural, so widely utilized in his fantasy writings, has been traced down to the impactful presence of Lovecraft’s writing. Both Leiber and Howard alike, thankfully, choose simplicity over the convoluted and adjective-loaded bizarreness of a Lovecraftian’s works. Fritz’s iconic short story, Smoke Ghost, serves as an entrée to Leiber’s fiction, with Our Lady of Darkness, The Hound, I’m Looking for Jeff and a few other ghostly works constituting the main course of Howard’s analysis. For Leiber’s ghosts did not sit upon the grave, nor did they sing a song to Romanticism; instead, they were covered with soot, stripped of their eeriness by the hassle and bustle of the contemporary industrial city. The urbanity of the characters and setting, however, did not manage to gaslight the urbane in Leiber’s style. To contradict this city-like ghastliness, Howard chose August Derleth, a slightly less popular, though equally fascinating author of horror fiction, heavily influenced by a colleague in the same line of work, H.P. Lovecraft. Contrary to Leiber, Derleth evaded the metropolis, concentrating on wording climatic family sagas, which in Howard’s view, were “brooding and grim” (p. 25). His involvement with the supernatural was more sensational, which, on the other hand, he had a tendency to overuse in his pulp writing. Howard indulgingly immersed himself into portraying the vicissitudes of the characters appearing in Derleth’s novels, quoting profusely from the Sac Prairie Saga to reveal the power of the writing craft of Lovecraft’s friend. I dare suspect that behind the literary voracity of Howard’s academic mind lies a certain sympathy for Derleth’s writing, followed by the need to venerate him in the eyes of the reader. In the light of quite unfavorable criticism of Dertleth’s take on Lovecraftian Cthulhu Mythos, the necessity to emphasize the quality of his writings appears to be justified. One failure does not determine the quality of the writing craft per se, but rather pinpoints its individual valor. Hell may be raised on Earth in many different ways, and for Derleth, it was the sinister madness among the picturesque lands of Sauk County. On par with the climatic ghastliness of doom, Howard went on to scrutinize the works of Carl Jacobi, a journalist and a writer of horror and science fiction. Depicting Jacobi’s life story, one cannot resist the temptation to guess that his dynamic and uneven life has been reflected in the quality of his writing. Howard, however, gives credit to Jacobi’s high-quality horror stories, cherishing the writer’s enormous progress with bettering the quality of his stories. A peculiar feature distinguishing Jacobi’s fiction from the writings of his contemporaries was “an atmosphere of doom and weirdness” (37) percolating each of his stories. Howard moves on to emphasizing the writer’s art of making a lasting literary impression through intriguing titles (e.g. Jacobi’s debut story “Mive”), which, alongside his previous technique, pinpoints Jacobi’s awareness of the basic marketing skills. Being a writer, who, similarly to his fellow ink slingers, partially earned his living through publishing in Weird Tales, it would not be surprising at all; especially if one was also a reporter. Deploying all your power to stun, or make a character (as well as a reader) feel uncomfortable seems to be at times a quality as long-forgotten in modern writing as Carl Jacobi’s fiction. A focus on the forgotten led Howard to analyze the writings of Arthur Machen, whose interest in weirdness was permeated by the air of religious elation. Concerned about the decay of Christianity, which Machen ascribed to the lack of “‘Holy Things’ and the eternal mysteries” (50), he contributed to its ascension through science fiction writings. Destiny, eternal truths, and the mystery of the universe constructed the axis mundi of Machen’s prose. In his view, humanity could be redeemed by means of art, and literature was one of the aiding measures that could be implemented in order to achieve this result. As Howard indicated, Machen’s technique could be strikingly visible in Hieroglyphs. So fascinating was this piece of prose that Howard dedicated a separate chapter to its deconstruction, a decision he also made for some of Leiber’s and Derleth’s works. Howard’s essays, however, are not limited to three names only. The pantheon of recognized and respected writers of speculative fiction is interlaced with such names as William F. Sloane, an author of two novels, To Walk the Night, and The Edge of Running Water, M.P. Shiel, R.H. Benson, Baron Corvo, Nevile Shute. 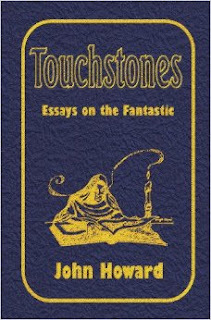 Howard provided a clear and concise description of their works, emphasizing the writers’ individual peculiarities of their writing craft. An interesting case among the wordsmiths of the fantastic is Gunter Eich, a German poet and playwright who boldly embraced radio technology to send his texts on air. His radio drama, Träume (Dreams), tantalized the audiences of post-war Germany. Flummoxing and daring, it brought to my mind Orson Welles’ famous radio broadcast of The War of the Worlds, although it did not cause desperate droves of people to abandon their homes in fear of alien invasion. Eich’s war was not so alarming in effect, but definitely disturbing. Utilizing the medium of dreams, he craftily metaphorized a variety of historical events that had impacted his life, as well as the existence of his fellow Germans in the Third Reich. Onerous and profound, the chapter on Eich’s peculiar radio drama provides a one-of-a-kind insight into an era in the shadow of Hitlerism. Figurative, fictive and anything f-related permeates James Howard’s peculiar collection of essays on the fantastic. However illustrious and eye-opening this book may be, it might be felt that the author was wording his texts in favor of phantasmagoric phenomena. The prevalence of texts scrutinizing horror (even in the presence of articles dedicated to science fiction and fantasy works) is distinctive, slightly outbalancing the perception of the fantastic. Be it due to personal preferences that were (sub)consciously voiced here, a cluster-like structure of the book (and a rather limited number of studied authors), Touchstones unveils only a fraction of what the fantastic comprises in toto. For those who are satisfied with picking small crumbs of random though informative knowledge, Howard’s collection of essays will be a perfect literary snack. To those, however, who crave for a full meal, Touchstones will be a mere aperitif that will whet their appetite to read positions offering a more orderly and detailed analysis of the fantastic. Regardless of how strong your craving for knowledge, Howard’s collection of essays will surely leave its trace in your mind.